Sunbrella Cushions | What Are Sunbrella Cushions? If you are wondering what Sunbrella cushions are you are not alone. Unless you have had the opportunity to shop for replacement cushions recently for your patio or sunroom furniture, you probably are not familiar with the cushion fabrics available for todays cushions. Cushions fabricated with Sunbrella fabric are the best cushions made in today’s market because they are durable, don’t fade and they clean up quite well if they get dirty. 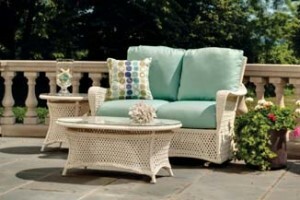 Cotton fabric cushions could not hold up to extreme outdoor conditions. In the search to find a quality replacement for cotton cushions that held the same rich feel and look, Sunbrella fabric was developed and used in cushion making. What makes a cushion a Sunbrella cushion is the fact that the fabric used to make it is Sunbrella fabric. Sunbrella fabric is an incredible modern acrylic fabric designed to be used and exposed to extreme weather and temperature conditions and not degrade. Sunbrella fabric is a 100% solution dyed acrylic. This means that the color of the yarn is solution dyed meaning that the pigment color is embedded into the acrylic fibers through a solution process in making the fibers before it is woven into fabric. The solution dye process is completely different than a fabric that is printed. Prints use inks that are painted on the surface of a fabric. Inks do not hold the same resilient qualities that solution dyed acrylics do. What makes Sunbrella fabric the best fabric for outside is that it holds all the important properties we want for a quality fabric for cushions. Its does not bleed, fade or degrade, and it resists and repels water. It stays soft and the colors stay vibrant and the fabric is easy to clean. You can choose from various types of cushions including polyester filled tufted cushions, solid foam and Dacron filled cushions. Each has their own qualities and characteristics. All are good for outdoors and inside. Choose the one thats best for you. So you see, Sunbrella cushions can be any style or type of cushion you want, providing the cover is made from Sunbrella fabric. Buying a cushion that is made using Sunbrella fabric will ensure that you have one of the highest quality made cushions available.